What would we see if we stood on an alien world? As the word ‘alien‘ originally meant ‘foreigner, stranger, one who is not a naturalized citizen of the country in which they are living,‘ we naturally expect everything alien to be different, and perhaps it will be, but the laws of physics are universal so we should expect some similarities. The classic sci-fi interpretation is often as though a blue/purple/black filter (or blood red filter) had been placed over the lens of a camera just for the sake of it. And although there is some scientific basis to this assumption, as different stars will emit different intensities of radiation, it is an overly simplistic way of coming up with something ‘different‘ for the sake of being different. We have black plants here on Earth, though, making them not-quite-as-alien as we thought. The danger is that science fiction may be trying too hard to come up with something radically different just so it seems alien, with alien being synonymous for jaw-dropping and unexpected. Reality may be stranger than fiction in that the laws of physics and chemistry are what determine biology, and as the laws of physics and chemistry are universal, astrobiology too may be much more similar than we’d expect. 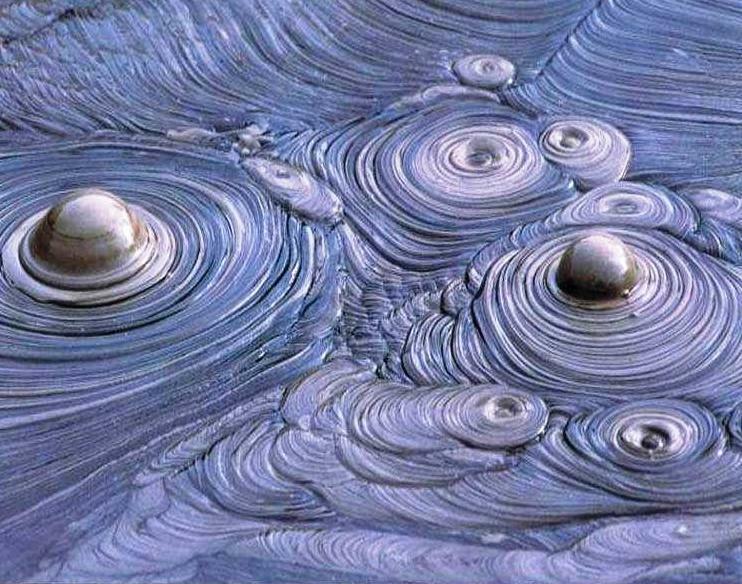 Theoretically, life could arise in a multitude of places we wouldn’t anticipate, using chemistry we haven’t seen exploited on Earth (like silicon-based lifeforms), but as a university professor recently pointed out to me, the odds on favorite has to be carbon from a purely chemical perspective. Carbon is the most versatile atom for forming complex molecules. So what would alien landscapes look like? Well, they’re going to be bound by the same laws of physics and chemistry we have on Earth, although probably in different proportions, as it’s unlikely there will be the same gravitational strength, or atmospheric mix, etc. I’d venture to say with the astounding diversity of environments we see on Earth, there’s enough versatility to give us a good idea about alien landscapes. 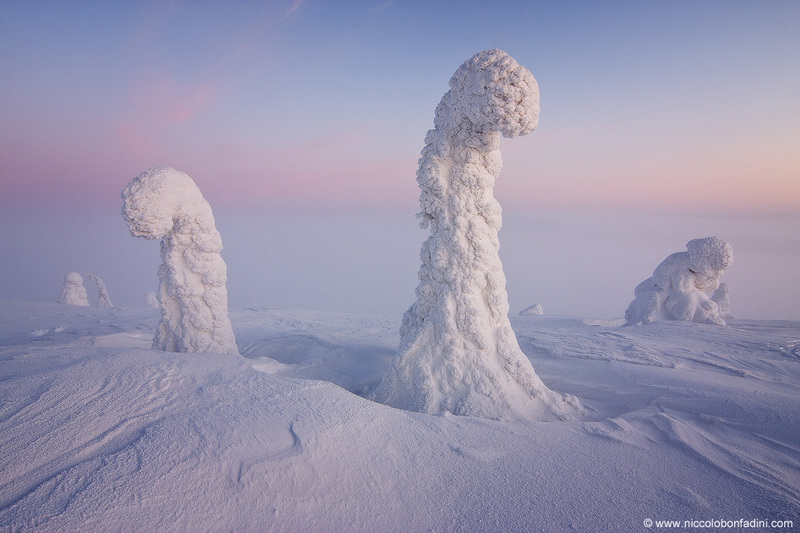 These are snow covered trees in lapland, with temperatures dropping as low as -40c in winter, these hardy trees survive encased in ice. Just a couple of hours from where I was born you can find boiling mud in the thermal wonderland of Rotorua. As a kid, I’d marvel when we’d stop by the side of the road to watch mud bubbling away in the forest. If you ever get to Sydney, Australia, you should take a trip to the Blue Mountains to the Jenolan Caves. It takes several hours to walk through these caves, but the stalactites and stalagmites are magnificent. No, it’s not Superman’s Fortress of Solitude. 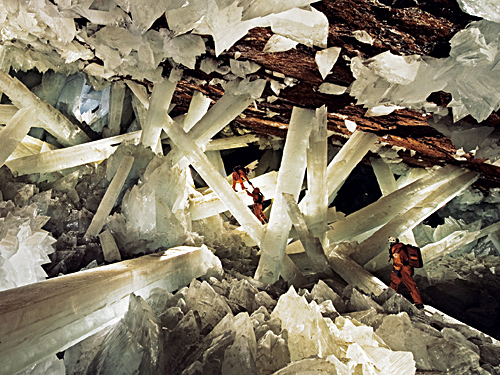 These giant selenite crystals have grown beneath the ground in Mexico’s Cueva de los Cristales. With temperatures reaching 58 °C (136 °F) and up to 99% humidity, these caves are largely unexplored, but crystals have been found almost 40 feet long, weighing up to 55 tons. 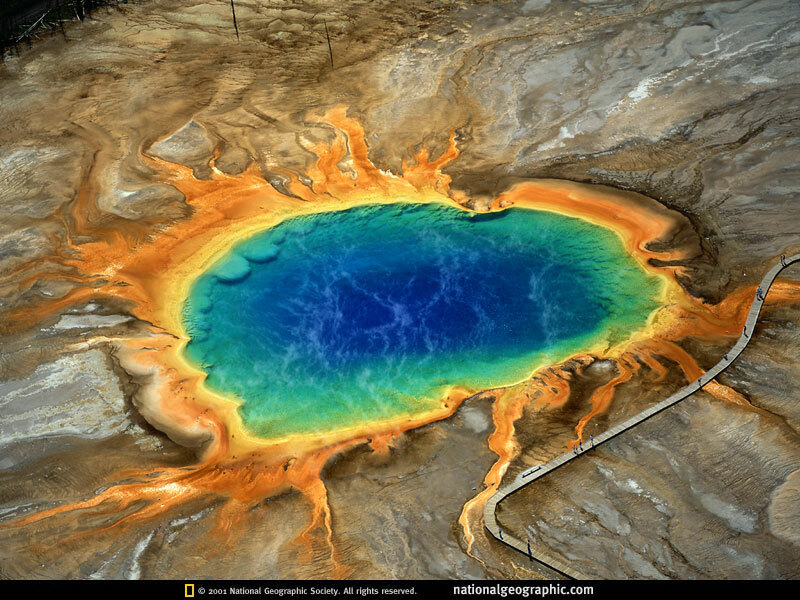 Grand Prismatic Spring in Yellowstone is an example of how “alien” life on Earth can be. The deep blue color is the natural result of water clarity and depth, but the greens, yellows and ocre-reds are all the result of bacterial life. In particular, this spring hosts chemotrophs, microbes that use chemicals rather than photosynthesis as their energy source, but its the cyanobacteria, photosynthesizing bacteria, that give off the green, yellow and ruddy colours. Chemotrophs and cyanobacteria are among the oldest forms of life on Earth. Any alien world will undoubtedly have volcanoes, but, as we have seen within our own solar system, not all volcanoes seeth with boiling magma. The moons of Jupiter, Saturn and Neptune have all displayed cryovolcanoes, erupting with cold/frozen gases and liquids such as water, methane and ammonia. 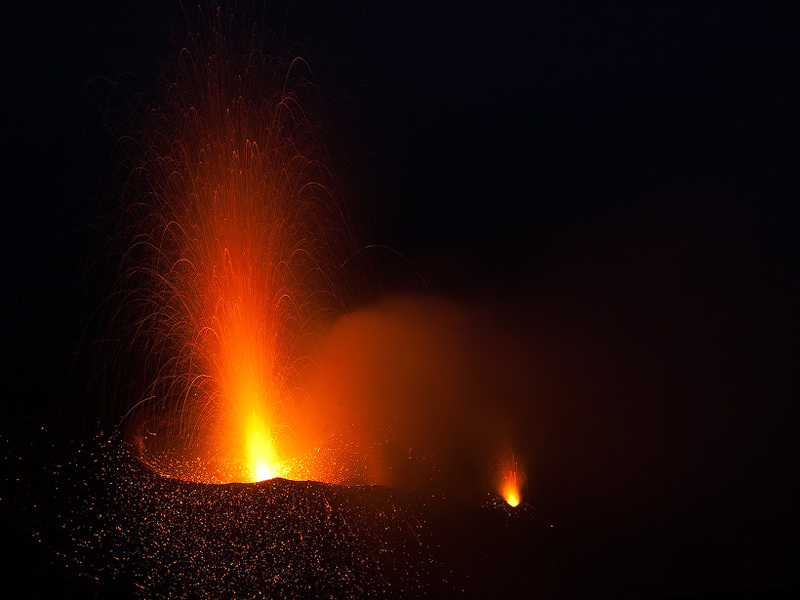 Volcanoes like these may well be the chemical mixing pot for life on other worlds. 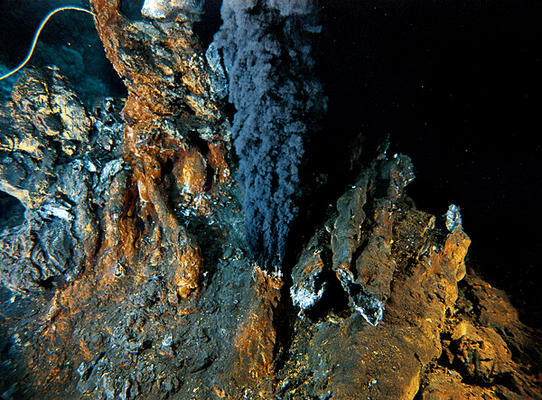 Here on Earth we see a variety of life arising around volcanic hydrothermal vents where sunlight can never penetrate. Although it might look like something from the Alien franchise of movies, this microscopic worm was discovered around a deep sea thermal vent. 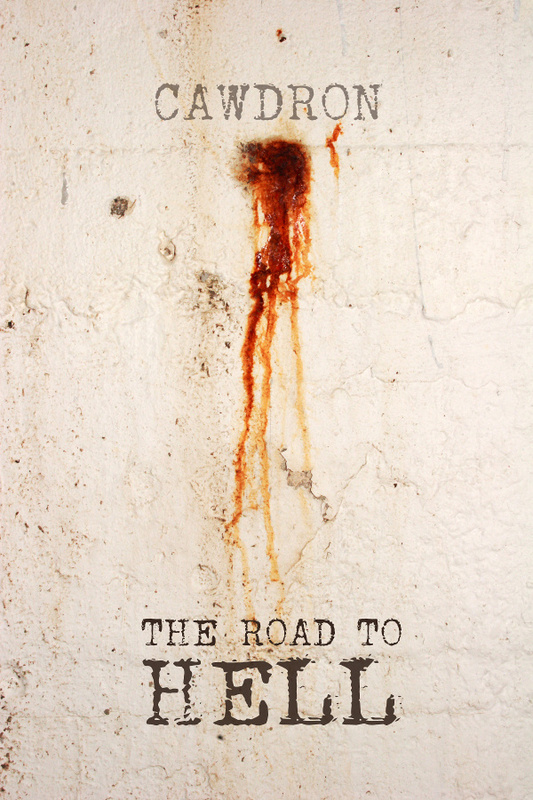 With nematodes being discovered up to a mile beneath the Earth’s surface, the extreme boundaries at which live can thrive continues to be redefined. Life is far more remarkable and surprising, resilient and prolific than we dared to imagine even just a decade ago, raising hopes of life being able to etch out an existence in the far-flung corners of our own solar system on planets and moons like Mars, Enceladus and Europa. Very nice ‘worm’ that the last one. I wonder what could be the scale of the image… mm or microns? Your blog’s easily becoming a favorite place for me to visit — so many wonders of nature, fiction and discovery! Great post! How bizarre… I left a comment on your blog congratulating you on completing your book and that didn’t post either… I’ll try again. WOW… that’s astounding… Thanks for telling me about these crystals. I’ve revised the post and added them in. Damn, someone beat me to the crystal cave. 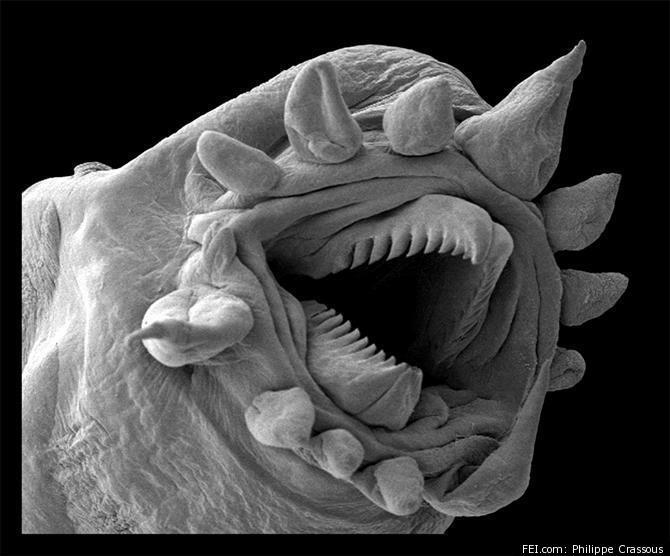 I’m pretty sure a super size alien might look like that nano worm (and uglier maybe – imagine if it is self-aware with space ships). I’m pretty sure we’ll find a planet that is mostly one of those places predominantly with little other places, like we find here on Earth. Or maybe something so new that we couldn’t even imagine. Cheers. I was surprised to hear these crystals are only half a million years old, as that’s nothing in geological time. To your point, that highlights how quickly entirely new environments can arise on Earth. Certainly, I would never have thought such a cave was possible on this scale. That cave, like everything else in the planet, to get that crystal “growth” so fast only needed to add some heat. The researchers experimented in the back of the cave that is even hotter and they realized that the heat helped form the crystals from the minerals found on the cave inside their bucket. They had to flood the cave after they collected their data since the crystals started to break due to some form of decomp (lack of fluid circulating the minerals from what I understood). Makes you wonder what else extreme environments can create with basic substances and how life would thrive. 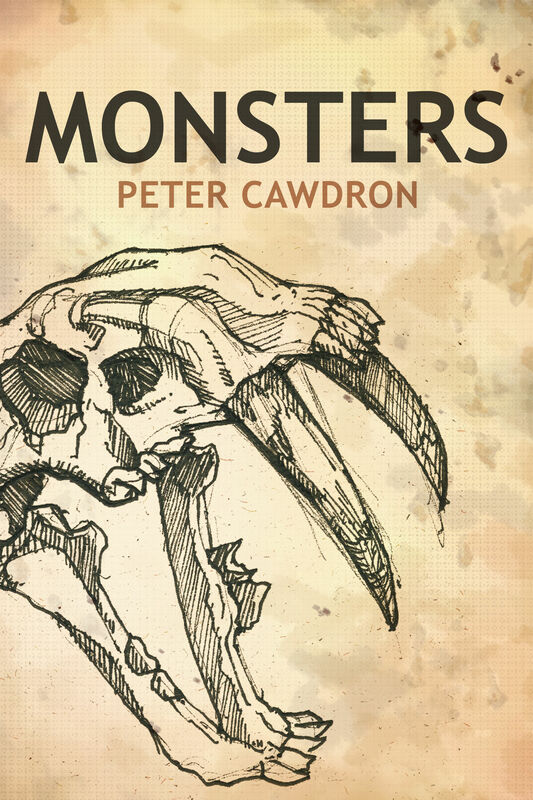 I liked your comment on alien species, perhaps not being as strange as Hollywood likes to imagine. I think the natural laws at work on any species that lives in a similar environment will result in similar solutions of body form. Like the convergent evolution of ichthyosaurs, dolphins, and sharks. We may be surprised at just how similar other intelligent species, on worlds similar to Earth, are to us. You’re absolutely right, the sheer weight of convergent evolution we see on Earth suggests that evolution elsewhere will find similar solutions to ours. And yet for all the convergent evolution we see, there’s still an astonishing amount of diversity. As an example, some of the most intelligent creatures on this planet are apes, dolphins, octopus and cuttlefish. I touch on this a little in Anomaly, but alien evolution is going to depend heavily on the alien environment, things like atmosphere density could change what portion of the electromagnetic spectrum is best for vision, pushing them into ultraviolet or infrared, etc. Gravity, temperature and atmospheric pressure all have an impact on chemistry, again constraining what evolutionary paths could be explored. It’s a FASCINATING subject… I’ll have to work up a blog post along these lines. I hope you don’t mind me using your ichthyosaur, dolphin & shark example, as it’s a great example of how the environment (the sea) naturally shapes the most efficient evolutionary outcome.